Fried Chicken, Beef Bulgogi, Chili Shrimp, and other lunch items $50 and under at GOLDEN BELL. This lunch-only option is the fried chicken of your dreams (the chicken comes with rice and fresh salad). Golden Bell Korean Restaurant, #58 Maraval Road, (Newtown, Port of Spain) or Shoppes of Maraval on Saddle Road (Maraval), Trinidad. (868) 628-0214. Link to menu. Paninis, Wraps and Salads from $24 to $48 at THE CANVAS. Grab wraps like a Roast Beef Club ($48) and Veggie Delight ($32) or a Turkey Panini ($32). The Canvas Bistro & Bar, #3 Long Circular Road, St. James, Trinidad. (868) 223-7251. Link to menu. “Snack and Meal Boxes” from $34 to $45 at HAKKA. One meat/fish plus one side for $34-$43; One meat/fish plus two sides for $37-$45. 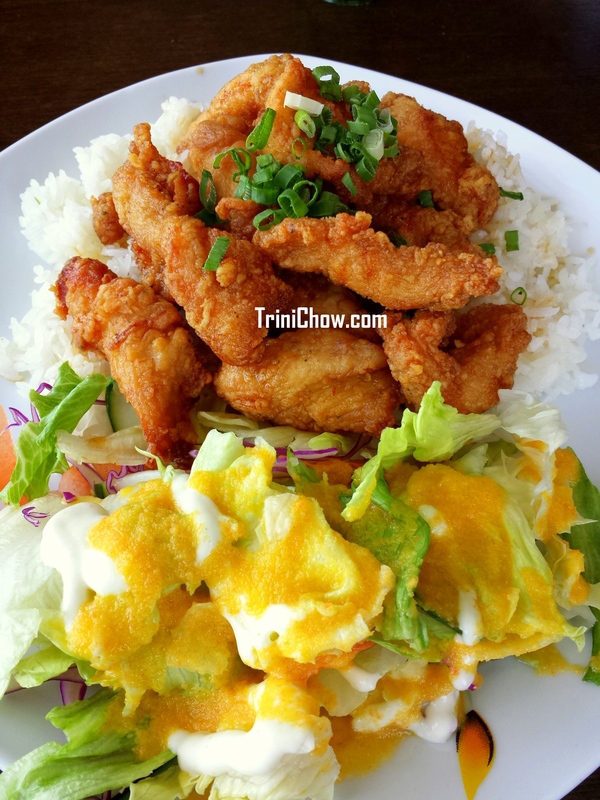 Hakka Restaurant & Bar, # 4 Taylor Street, Woodbrook, Trinidad. (868) 622-0004. Cheese Pizza $49.95 at CHOP CHOPS. Afternoon pizza special (Monday-Friday, 2pm-5pm) from a great pizza spots in T&T. Chop Chops Bistro, #43 Mucurapo Road, St. James, Trinidad. (868) 628-5555 or (868) 622-8989. Pita Sandwiches from $33 to $46 at PITA PIT. Everything from tasty grilled steak to veggie pitas here at Pita Pit (add a drink for $5 more ). Pita Pit, Starlite Shopping Plaza (Diego Martin) and Shoppes at Maraval, Trinidad. (868) 632-5893. Soup, the biggest bowl (also known as the Nah Boy) $30-40 at DE BOSS AH SOUP. Make it a soup meal from cow heel soup, corn soup, fish broth or beef soup at De Boss Ah Soup. De Boss Ah Soup, #48 Tragarete Road, Woodbrook, Trinidad. (868) 389-4455. Arepa (Plato) with 3 fillings $50 at TARYN’S. Awesome arepas here and with any three fillings (choose from chicken, beef, cheese, tuna, ham, black beans, etc. ), you won’t go hungry! Taryn’s, The Panyol Place, # 23 Mucurapo Road, St. James, Trinidad. (868) 622-3989. Link to menu. Wraps, Burritos, Tacos, Rice Bowls & Salads from $25 to $50 for the larger sizes at WRAP WORKS DELI. Choose your meal and then select your filling – chicken, steak, fish or veggies plus toppings and sauces. Wrap Works Deli, Corner Ariapita Avenue & De Verteuil Streets, Woodbrook, Trinidad. (868) 624-WRAP (9727). Link to menu. Jerk Chicken and other ‘yaad combos’ or a half-chicken from $25 to $50 at IRIE BITES. Irie Bites, #91 Ariapita Avenue, Woodbrook, Trinidad. (868) 290-2828. Link to menu. Tandoori Chicken Sandwich $65 at PECHE PATISSERIE. Our favourite spot for breakfast also serves a mean lunch, including sandwiches near the “cheap” eats price point. Peche Patisserie, Caroni Savannah Road, Chaguanas, Trinidad. (868) 222-8508. Veni Soup & Bake (Fish Broth, Pigtail, Corn, Beef, Veggie, Lentil, etc.) $25-$45 at VENI SOUP (downstairs from Veni Mange). Menu changes daily, but the soup and coconut bake is always delicious. Veni Soup, #67A Ariapita Avenue, Woodbrook, Trinidad. (868) 624-4597. Tell us in the comments what cheap eats we should add to the list! Great site, very helpful with lots of options of where to eat in the west – i like it!! I agree. Beneficial has some great food too the Asian legs and curry is the best. i don’t know why this place hasn’t been featured especially for the best in Arima thus far. Great list but please don’t neglect our neighbourhood vendors that are out very early in the morning and late at night to serve you. Doubles are $3 – $4. Bake and buljol or sada roti and pumpkin are $20 – $25. Not to mention your hearty corn soups that vary in prices from $15- $25. And most sandwiches are less than $30. You cannot be serious! Have you seen the portion sizes at Urban Oasis? A tiny wrap is $70! Thanks Sue for the information on Yatch Club’s lunch special. Can we just go or do we have to be a member or something? No membership is required to eat at the restaurant.